Note: this item was provided by Outlier for this review. 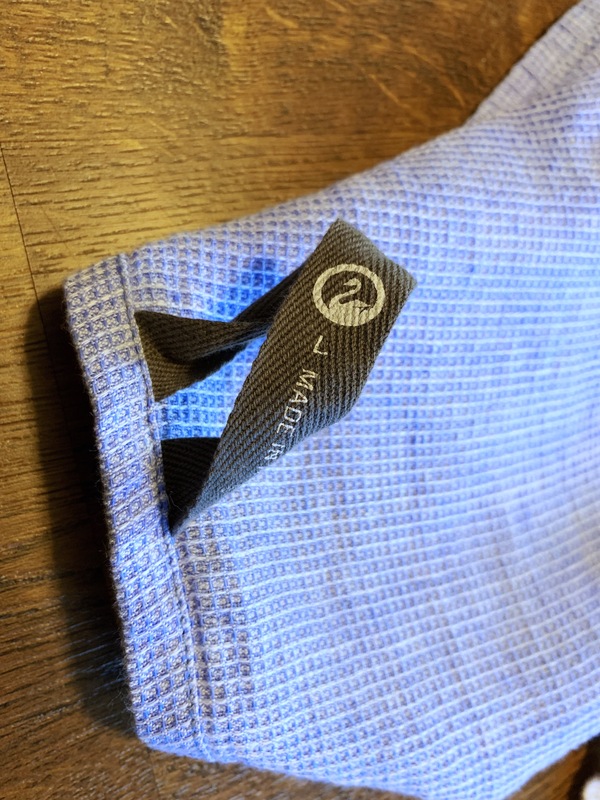 I’ve actually been using Grid Linen Towels for almost a full two years, both for travel as well as everyday. Outlier’s pitch for this towel is that it dries faster, weighs less, and packs down more. Ostensibly they have designed it to be the best beach towel you can buy, however, I’ve found mine are at home in my travel bag and hanging in my bathroom. The fabric itself is very rumpled and light. When you hold the towel dry, it’s decently hard to believe it’s capable of drying your entire body. It’s also rough feeling, especially when new, but over time (my almost two year old one is decently soft) the fabric breaks down and gets softer. The story is that Outlier set out to make a better beach towel — one that dries you off well, without collecting half the beach on it. This towel does do that — though I have only used it at the beach one time. A bigger story with this towel is that it is very lightweight and packs down pretty small, especially when you consider the utility of it. All of this leads to a towel that is very versatile. A lot of travelers like to take towels with them, this is better than any travel towel I have tried. Many beach goers need extra bags just to carry a beach towel, you won’t with these. And honestly, it’s a better bath towel as well. So the reason you want this is because you want to use a better towel, and you don’t accept that plush and fluffy is necessarily better. I’ll break this into two sections: at home, and travel. Let’s start with travel first. 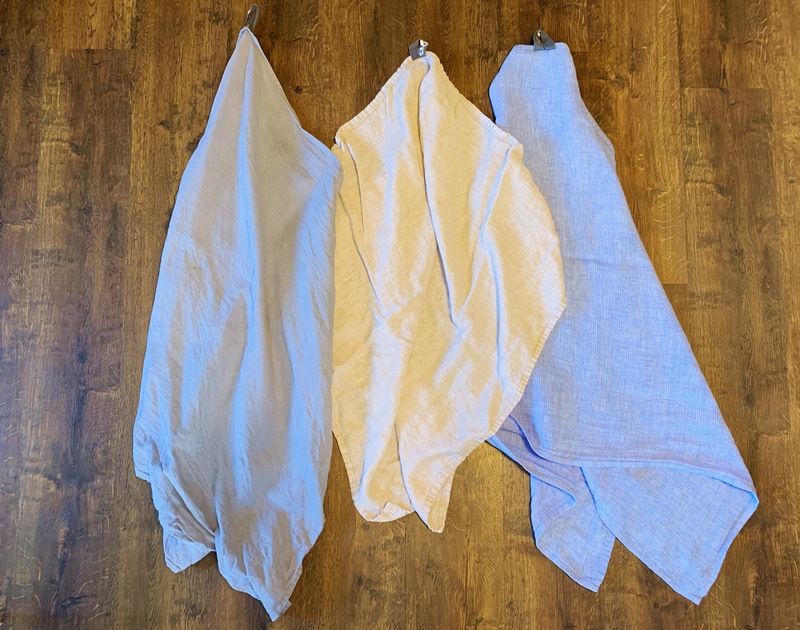 I initially traveled with the size large towel (56” x 36”, or about bath towel size) and found that while compact, there’s not a lot of utility for the type of travel I do with this large of a towel. I quickly switched to a size small for travel (15” x 15”, like a handkerchief) and then bought an extra one after just the first trip. 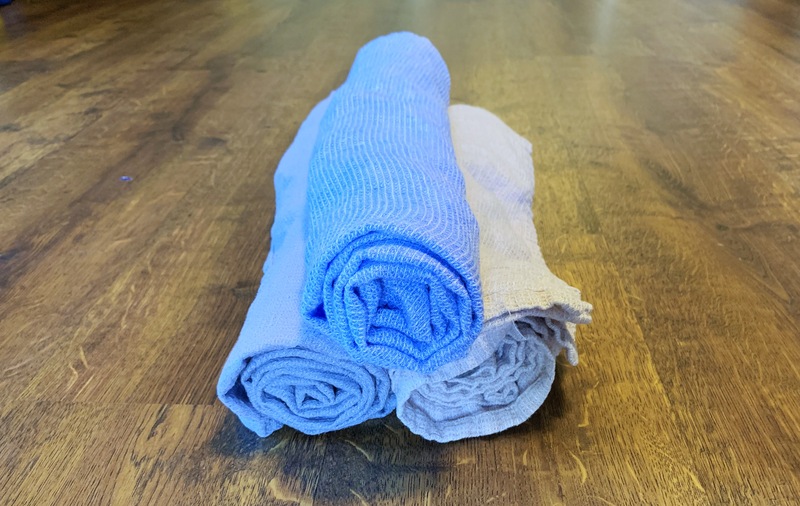 The small towel shines in travel because you always have a wash cloth with you, but one that dries fast enough that you don’t need to worry about carrying a sopping wet rag in your bag. One of the biggest uses I get with mine is a quick wash of my face with water after a long flight. I’ve also cleaned up many near disaster spills on planes from turbulence and carelessness. The towel absorbs water quickly and dries very fast. I mean it when I say: I do not travel without one of these towels, and I use it about every time. At home, I use one of the size large towels after every shower and I have done so for almost two years now. I actually have 3, including the one Outlier sent me for testing. After just the first use, I knew it was going to stick around as the towel for me. It takes a little getting used to though. For one, the linen is thin, and though it can absorb mountains of water, you need to move the towel around — not use just one area — when you dry your body off. Otherwise it stops absorbing water in those spots. This isn’t a big deal, but it will amaze you how long it takes to adjust to this. It’s also scratchy feeling, especially when it is new. That’s quite nice when you are drying your back — who doesn’t like a back scratch — but can be completely off putting for some people (like my wife, who thinks I am nuts). Overtime it softens, however, it never feels plush and fuzzy like those luxury hotel bath towels. Though, if those hotels knew anything, they’d be using these towels. Lastly, this towel dries really fast and that has a lot of benefits. The first is that it dries fast enough that gross smells do not tend to build up very fast on it. 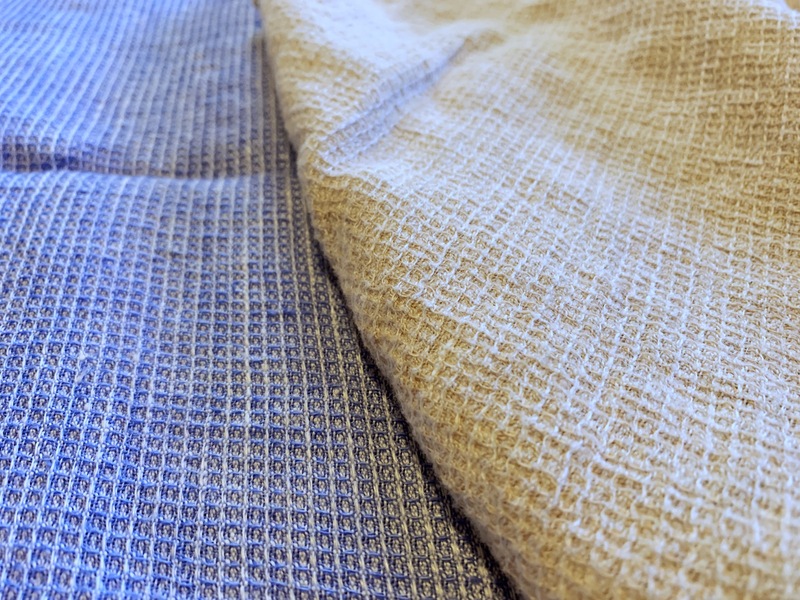 I did a test a while ago, and found that a standard cotton bath towel could last me about 3 showers at most before it started to build up a smell. This towel can last past 7, and honestly, I stopped testing because I started to feel a little weird about it. Another benefit is that if you take multiple showers in one day, you might have noticed that your standard bath towel may not have had time to dry. 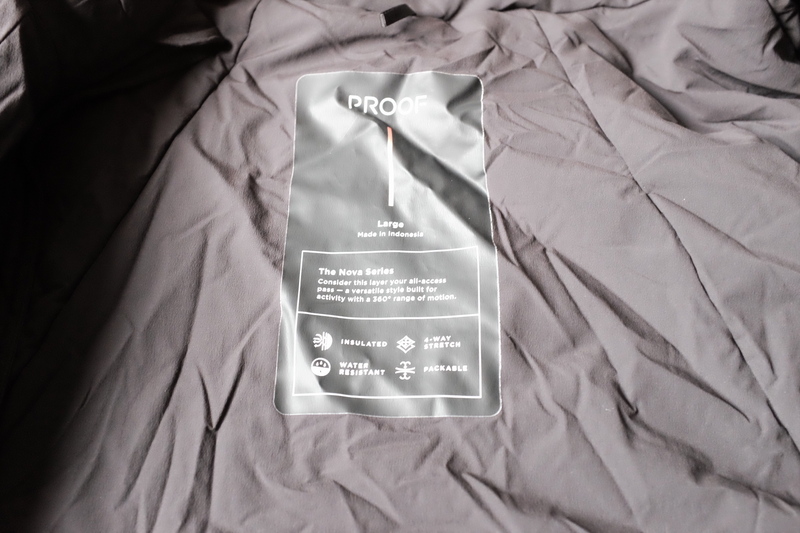 This towel tends to be dry after using it in a few hours time — which is awesome. It’s scratchy feeling. I don’t mind it at all, but there are going to be many who can’t fathom why you would want anything that is slightly scratchy. You likely know who you are already. Outlier notes that you should avoid washing this in top-loading washing machines. I honestly didn’t know that until Steve pointed it out when we got these towels from Outlier. I’ve been washing several of these in top loading washers for 22 months — not a single issue at all, other than the tag starting to come off one. Your mileage may vary, but I’ve seen no ill effects. Lastly, drying these is interesting. I’ve tried drying them by hanging them (Outlier provides a nice loop for doing so) and putting them in the dryer. If you use the dryer, the towels come out really soft and nice. If you hang them they have a scratchier texture to them until you use them a bit. Drying with the loop stretches the material a bit. Hanging from the loop works great, but will tend to slightly stretch the towel in weird ways — though not in any way that seems to be a deal breaker. However, hanging from that loop dries the towel very quickly, especially if there’s any type of air movement around the towel. I love this towel, and I have for a long time now. The small ones are fantastic for travel, and the bigger ones are the only towels I like to use for the bathroom. I’ve taken mine to pools as well, so that I know I can get myself and the kids dried off — because honestly there’s not a lot of bulk added with taking these. They work great at theme parks with kids too. I’ve tried clear blue, medium gray, natural, and gray rock. I like the look of the clear blue the best, the medium gray did get some discoloration as did the gray rock. The natural is also great and would be my second choice of colors. Bottom line: if you aren’t turned off by the thought of a towel that isn’t pure plush fuzziness, then you can’t get a better towel for yourself. Underwear is an important part of an everyday wardrobe and can make or break the comfort of any activity. 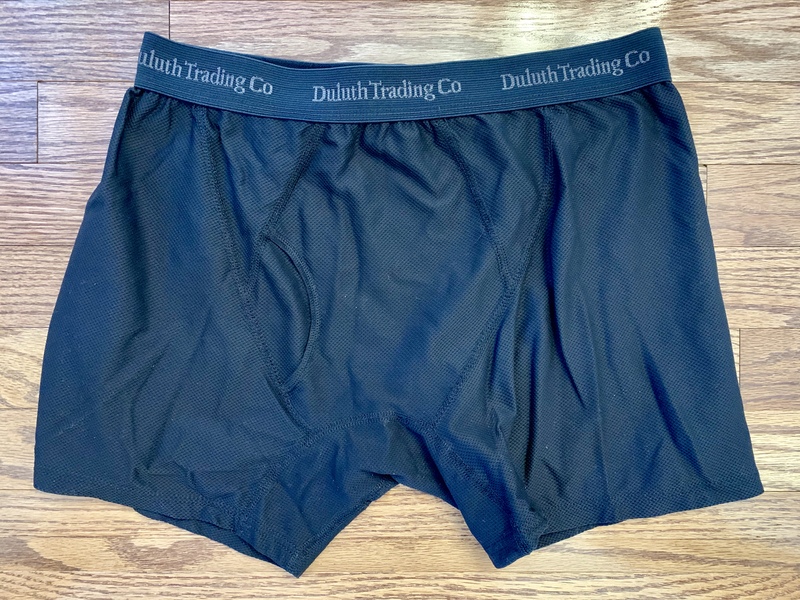 I’ve tried out quite a few new pairs of underwear over the past year or so, and I’ve made a change to what my go-to pairs are. 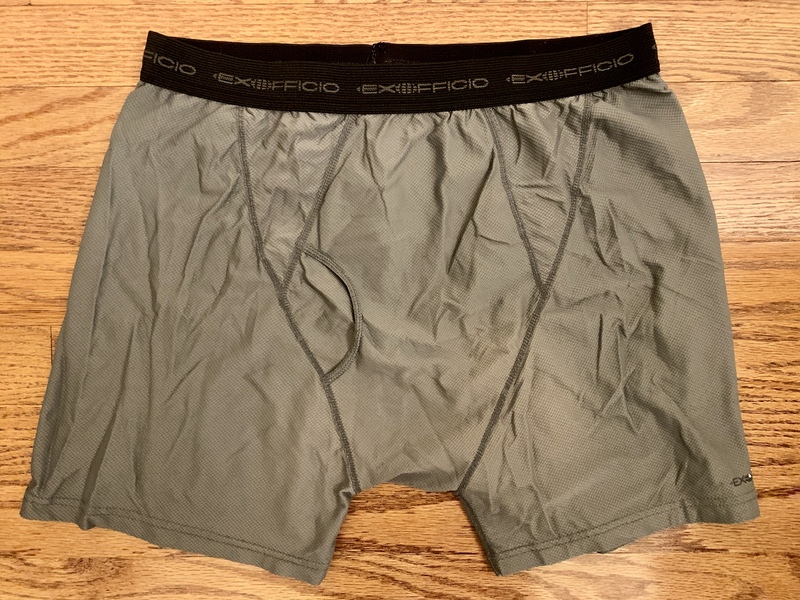 While this is nowhere near an exhaustive list, this roundup includes all the technical boxer briefs I’ve tried. 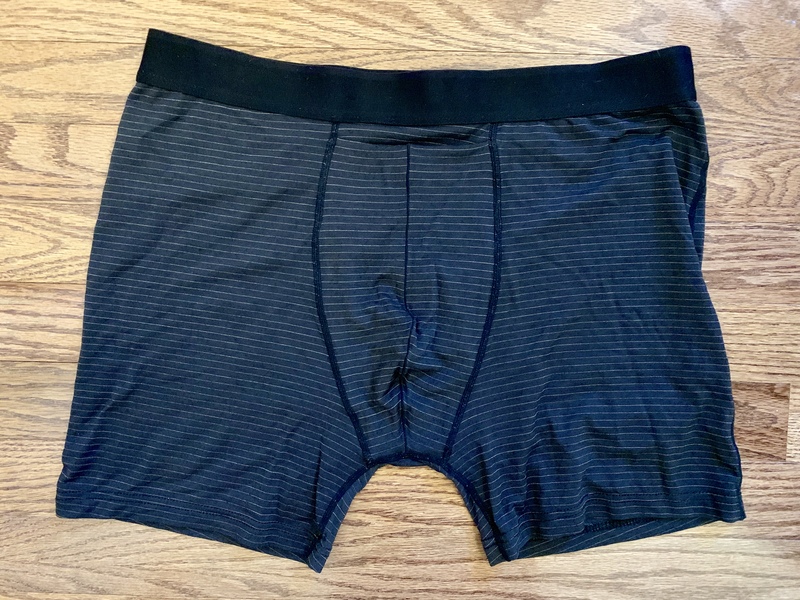 Across all the boxer briefs I tried, there are a few commonalities across the two main pain points — rolling of the waistband and riding up of the leg. 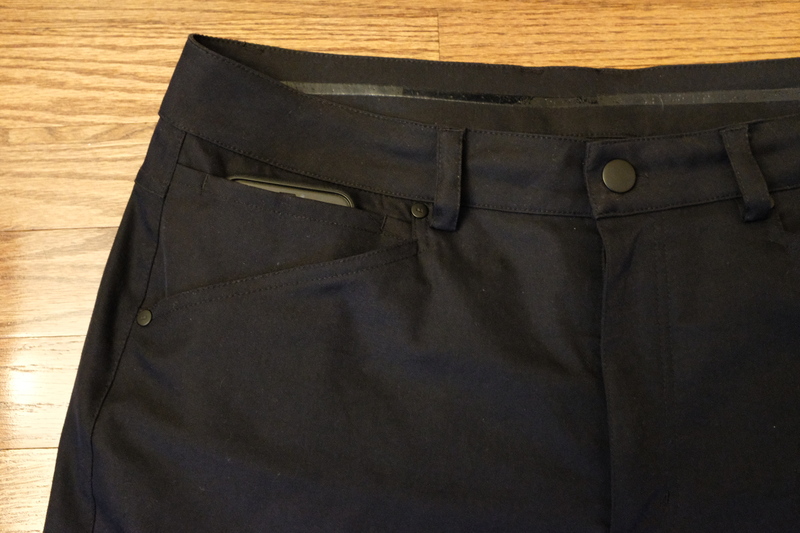 It seems to me that rolling of the waistband is a thing of the past (at least across all the brands I discuss here). This is something that can be very annoying, and something I haven’t had to deal with since I switched away from my cheap Hanes underwear. On the other hand, having the leg ride up is not something that has been solved (except for maybe the new Wool & Prince Boxer Briefs 2.0, I haven’t given them a try though). I find that all of my pairs of underwear can ride up under the right conditions. Two features that help mitigate riding up include a proper fit (tightness and length) of the leg. Lastly, I’ve yet to find any underwear that I can wear more than once (even with an antimicrobial treatment or merino content). That’s fine with me as I don’t find it appealing to wear underwear more than once. This makes drying time important for travel. The Give-N-Go Boxer Brief was my first foray into the performance underwear market. A few years back, they were the ones everyone talked about, but since seem to have declined in quality. 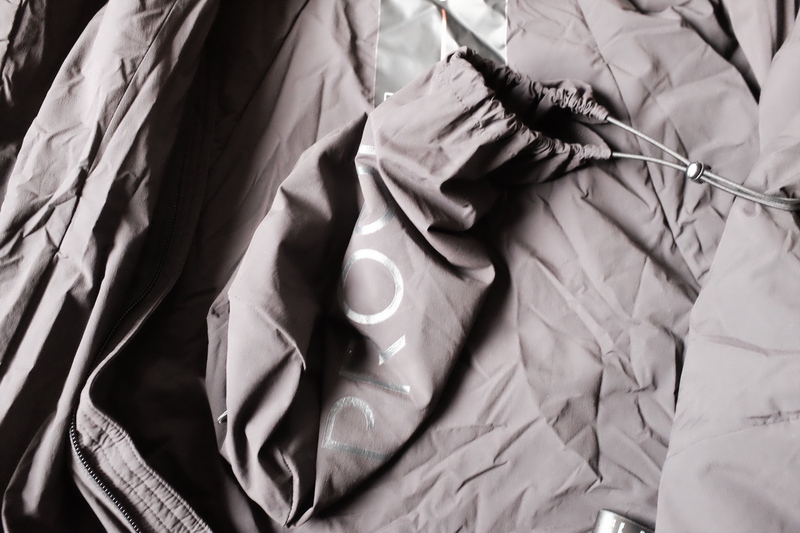 The fabric is 94% nylon and 6% Lycra with an antimicrobial treatment and a diamond knit. This makes the fabric have a rough handfeel and more likely to get caught on your pants. These do not have a structured front panel and have a somewhat baggy fit. The fit and fabric kill the appeal here. The Buck Naked Performance Boxer Briefs were next. They are still popular and are the most heavy/durable of those I’ve tried. The fabric is 93% nylon and 7% spandex with an odor resistant treatment and a diamond knit. The knit here, while not smooth, doesn’t seem to get caught on my pants. 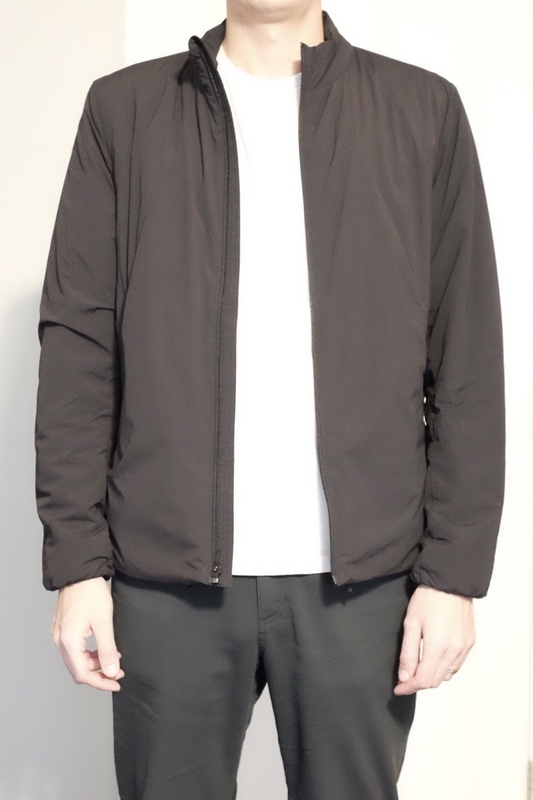 These also do not have a structured front panel and a similar fit to the ExOfficio pair. Again, the fit and fabric make these uninteresting, unless you’re going for durability. 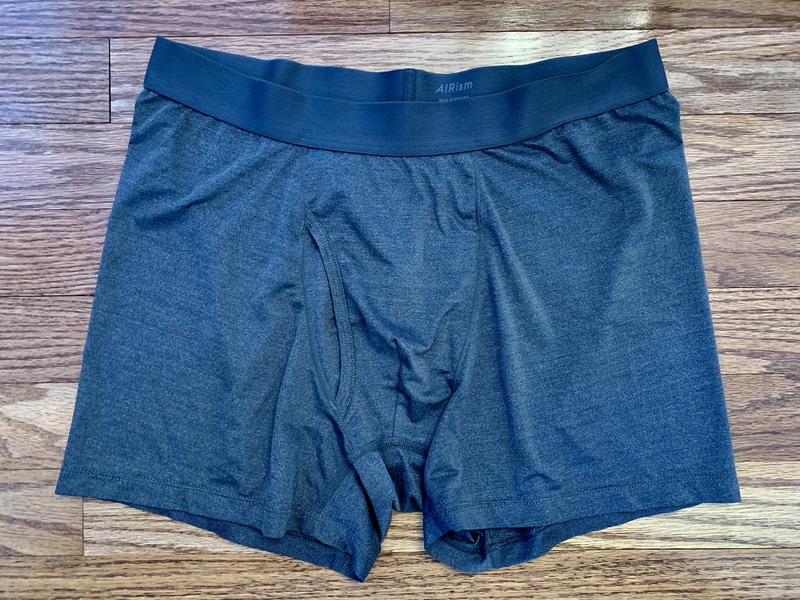 Once I got tired of the heavier fabric of the previous two brands, the AIRism Boxer Briefs seemed the natural way to go. Also very popular in the travel/performance community, these are hands down the lightest pair I own (in both fabric weight and packability). The fabric is 89% polyester, 11% Spandex with an extremely smooth finish that feels like silk. No matter what fabric you wear on top, these never get caught. The structured front panel adds to the comfort, and the tighter fit (and shorter leg) makes you forget you are wearing them. These are a good example of how the right fit helps keep the leg from riding up. These are my favorite overall. Along the way here on Everyday Wear, I got the opportunity from Y Athletics to try both their SilverAir Merino (full review) and SilverAir Ultralight Boxer Briefs. The Merino pair is 90% 17.5 micron merino wool, 5% metallic, and 5% spandex. The fabric is luxuriously soft and is quite thick. There is a custom leg grip system on each leg band that definitely helps keep these from riding up even when the legs aren’t quite as snug. The Ultralight pair is 50% nylon, 35% Modal, 10% Spandex, and 5% metallic with an open-knit. Just like the name says, the fabric is very lightweight and has an excellent silky feel. While there are no leg grippers here, the legs fit a bit tighter so I didn’t feel like I was missing out. I find the structured front panel in both of these pairs to be the most comfortable of all on this list. Overall, can’t beat the luxury of the Merinos and the Ultralights are right up there with the UNIQLOs. The fit is spot on here. Finally, I also recently had the chance from Pistol Lake to check out their Minimalist Boxer Briefs (full review). The fabric is Pistol Lake’s custom Lightweight Eudae fabric, which is 76% polyester, 19% Tencel, and 5% Lycra. The fabric looks and feels similar to a cotton t-shirt. While a snug fit, these do not have a structured front panel. Overall, these are great if you’re looking for cotton-like comfort and are willing to sacrifice performance. All of the boxer briefs perform well in all conditions with two exceptions. The SilverAir Merino feels a little heavy with a lot of sweat, just like any merino piece, but dries quickly as the moisture evaporates from the core of the fibers. 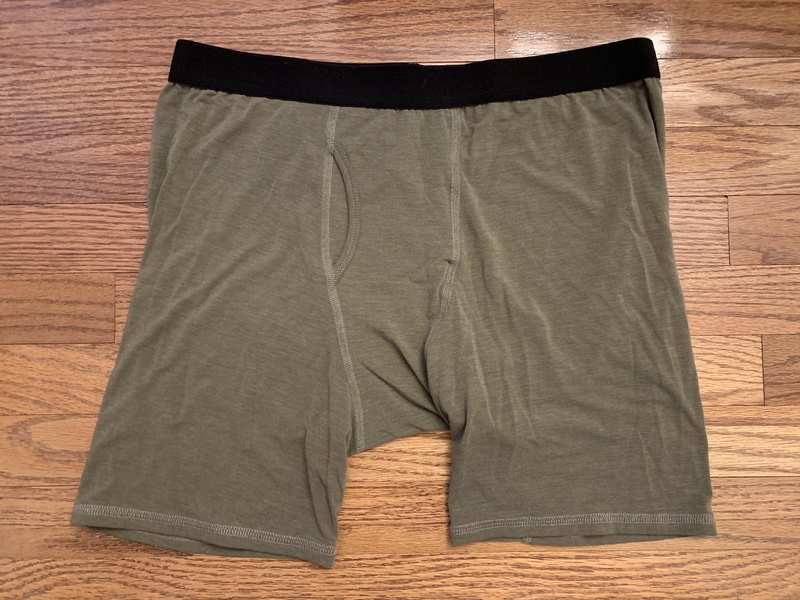 The Minimalist Boxer Briefs feel heavy and moist with a lot of sweat. This was a surprise after trying their shirt made from the same fabric, but these are the only pair that I don’t really enjoy wearing for exercise. Hands-down I prefer the AIRism Boxer Briefs for travel. Their extremely light and silky fabric and shorter length makes them pack down to nothing and dry quickly after a sink wash. Also, if they do ride up, they are the least noticeable. The most comfortable of the lot are of course the SilverAir Merino, nothing beats the luxurious soft feel of high quality merino. When combined with a great structured front panel, these will be hard to beat in the comfort department. The Minimalist Boxer Briefs also up there in comfort because they have a cottony feel and the long length helps keep the legs in place. After wearing most of these boxer briefs for at least six months, if not longer, the UNIQLO AIRisms have become my top pick. Not only are they lightweight and comfortable, they are a great value at just $10 (and often can be had on sale for $5). At that price, there is no reason not to stock up. If the cost wasn’t involved, I would say the Y Athletics SilverAir Ultralights would be my top pick, as they are a bit more comfortable than the AIRisms. Finally, for comfort above all else (while still maintaining excellent performance), I haven’t found anything more comfortable than the Y Athletics SilverAir Merinos. Note: these were provided by Bluffworks for this review. The best I can recall, it’s been 2 years since I owned a pair of jeans, and perhaps a little longer since I wore them at that. 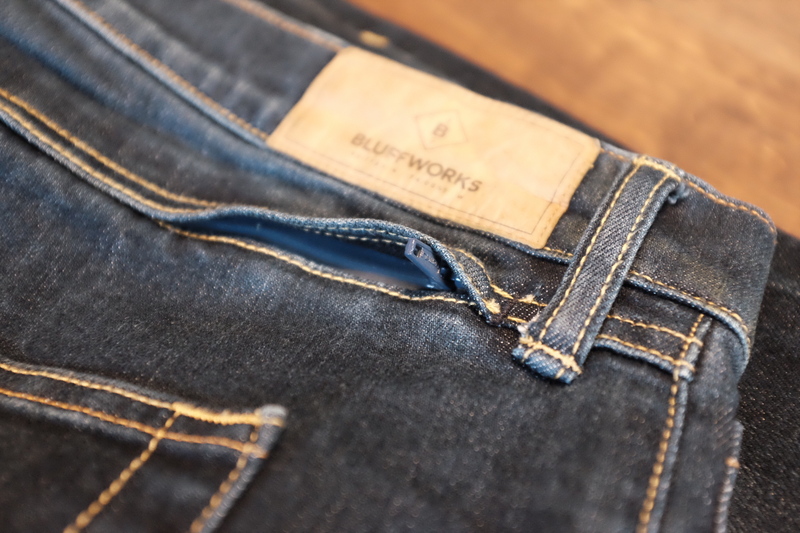 So the Bluffworks Departure Jeans are my first jeans in quite some time, and I will fully admit that it was weird for me (and for my wife) for me to be wearing jeans again. At the same time, these are super comfortable jeans. The idea with these jeans is that there are some people who refuse to give up denim, and thus they should be offered a better pair for travel. Bluffworks did this with a custom material, as well as adding a few slick features. First thing you need to understand is that these are not like many of the “modern” 5-pocket type of pants we talk about. They are not made from a completely technical, non-cotton material. They are trying to improve upon jeans, while still keeping them jeans. To that end, Bluffworks came up with a blend of: 68% Cotton, 22% COOLMAX Polyester, 9% Rayon, and 1% Spandex. There’s a lot going on there, but suffice to say they basically feel like a stretchy pair of standard jeans, even the weight/warmth feels like jeans. These feel closest to a pair of jeans I had which were made by Mavi, meaning they are very soft to the touch. They look and act mostly like traditional denim with the stretch barely noticeable. Happily, the jeans will easily cuff and remain cuffed — something which more technical materials still find mostly elusive. The COOLMAX is the biggest addition, which is a fiber designed for moisture wicking and breathability. Given that we are in the dead of winter, I have yet to be able to test anything about this aspect of the pants. I will note that they don’t seem to dry any faster than standard jeans when they get wet. I’ll first start by saying that I really hate it when clothing manufacturers add zippered pockets to clothing. These types of pockets almost always look silly and get in the way. The Departure Jeans have two of these zippered pockets on the back, which are hidden in the seam above the standard back pockets. What’s really amazing here is that you cannot tell these pockets exist in any way. 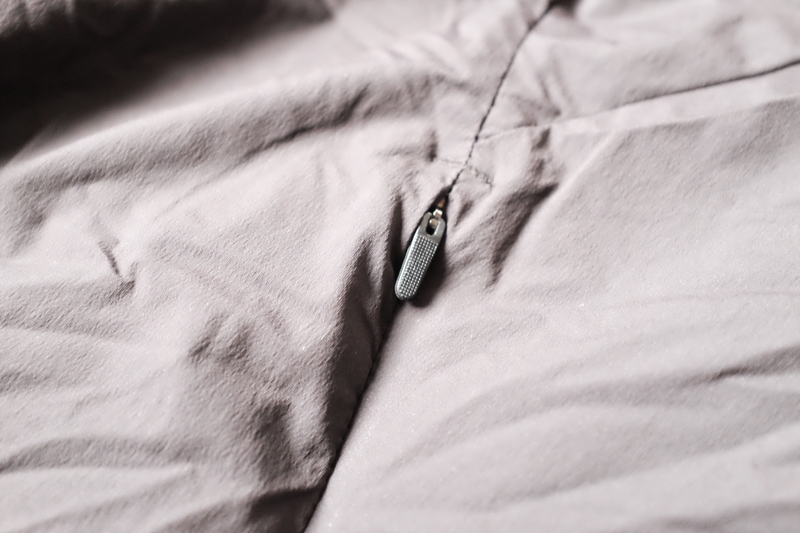 The inner part of the actual pocket is a thin and almost nonexistent material. On the outside of the pants the zipper is perfectly hidden and perhaps the most discrete zippered pockets out there. What this all means is that if, like me, you wish pockets like this didn’t exist then these won’t bother you at all. However, if you do like having secure pockets like these, then they are here for you and are the best I have seen. 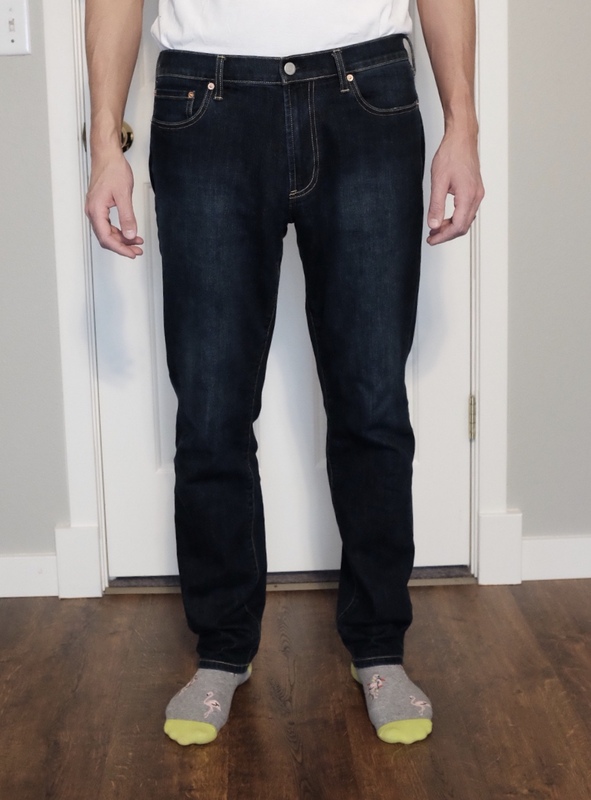 I have been wearing these jeans non-stop since I got them, with only one day (while they were being washed) switching back to the pants I normally wear. I’ve found them to be extremely comfortable. There’s no doubt about it, for non-travel and casual lounging wear, cotton still is king. These pants prove that out. Moreover, they move very freely, more so than any other jeans I have owned. I have had no issues working in the yard, folding piles of laundry on the floor, watching TV, chasing the kids, or any other activity I’ve done while wearing these. If nothing else, these move extremely well. The fit on these is classic, not slim or baggy. They also look identical to standard jeans. There’s nothing to tell people that they are anything but ordinary jeans one way or the other. 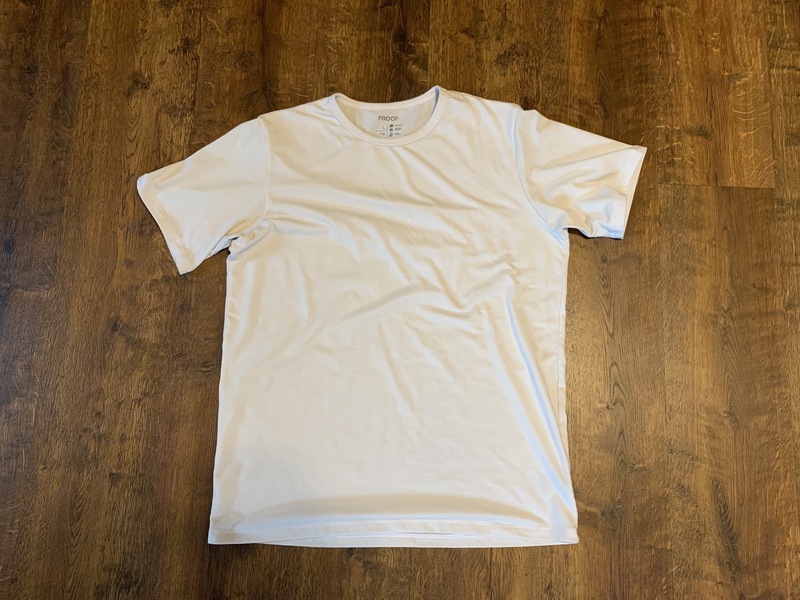 The wash is accurate at a medium, but I might prefer a slightly darker wash. All in all, I have no complaints whatsoever in the comfort department. I think the elephant in the room for me is whether or not these work for travel. This is largely going to depend on how you travel. If you are among the many people who simply refuse to travel anywhere without jeans, then these are certainly a better option that what you normally pack. 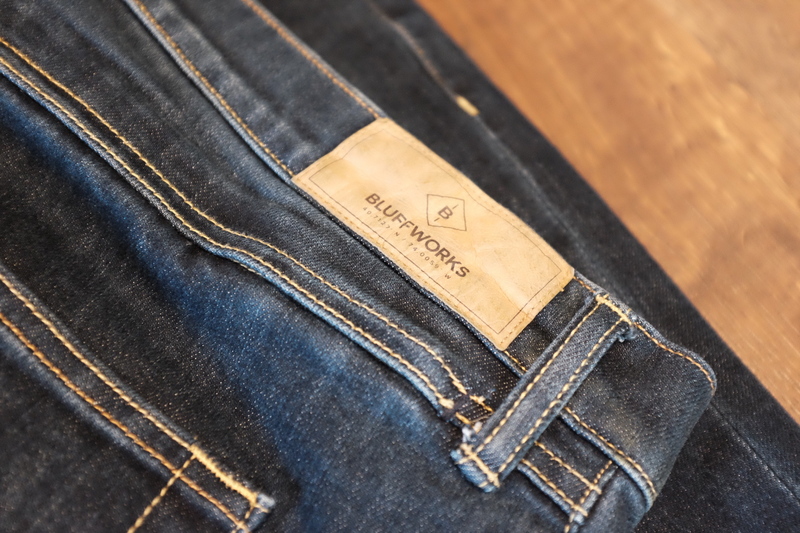 Bluffworks says that these are 11oz per yard, whereas most jeans are 14oz — that’s hard to conceptualize, so think of it that these jeans are going to weigh less than standard jeans. However, if you are someone who wears more technical pants (like me) then you’d be hard pressed to want to travel with these. They will not dry very fast if you sink wash them. 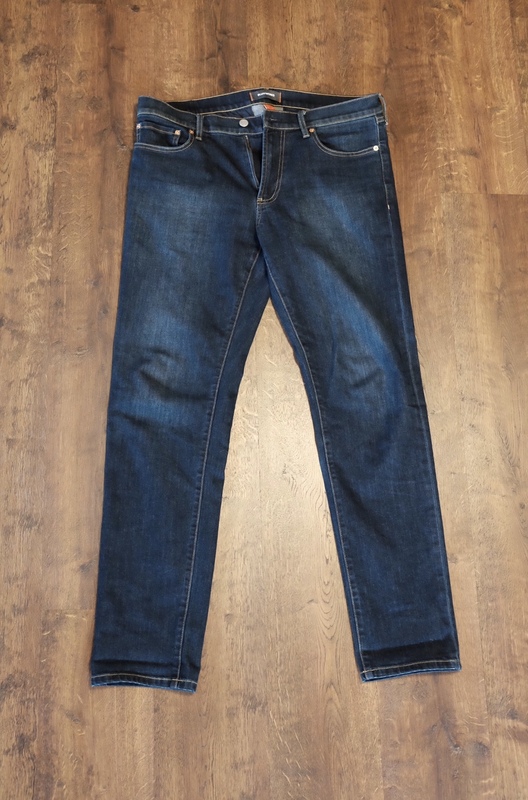 They won’t repel dirt or grime any better than standard denim. And they will take up more space than your technical pants. Where these really fit in for me is in the classic style domain. If I am not flying to my destination, I wouldn’t have a good reason not to pack these. So while they may not be the best option for a jet setter, they are a very good option for a weekend away. How much better than a standard jean — for that you’re going to have to ask someone who regularly wears jeans. One thing I tested with these is a wash and dryer cycle. Though, not recommended, I found that tossing them into the dryer only barely shrunk the waist, while nipping a bit more off the length of the jeans. I mostly did this to break them in a bit more, and because I find myself in between sizes with my pair being slightly too big in the waist. I wouldn’t recommend you do this, but the pants didn’t fall apart when I did. My only nitpick about these jeans is the fifth pocket, which seems unnecessarily large. Other than that, these are very comfortable and classic looking jeans. The price is right in line with what I always paid for jeans, and is certainly less expensive than most other pants I buy. These are jeans, and if evaluated solely against other jeans, they rank very high for me. Evaluated against more technical five pocket pants, they only win on aesthetics. That said, there are very few Americans who don’t own, or like wearing, jeans and these are a particularly comfortable pair of them. If you’ve been reading Everyday Wear, you know we are fans of Pistol Lake apparel. 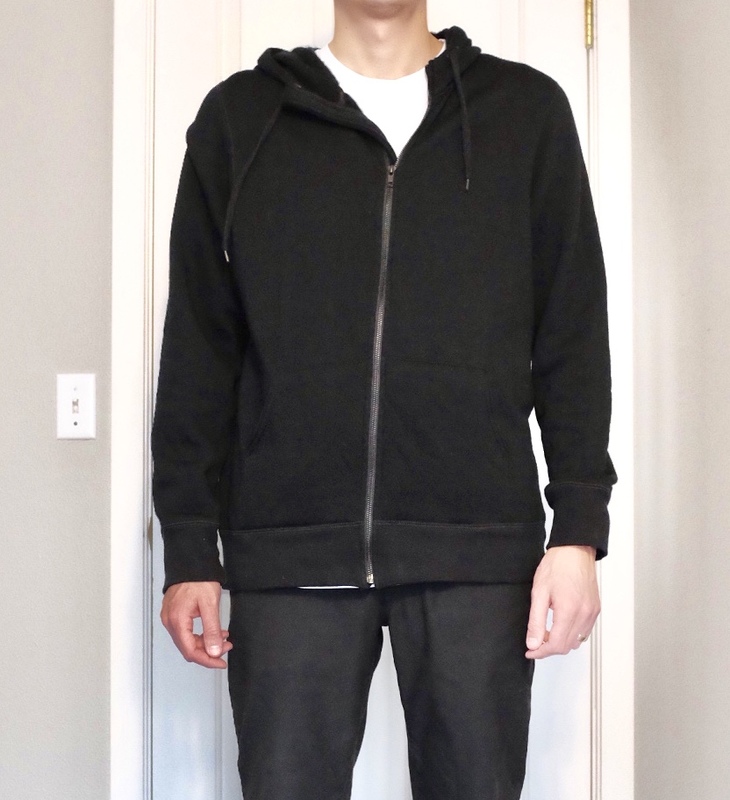 They recently sent me their Minimalist Pullover Hoodie to check out and I’ve been pleasantly surprised. I typically am not a hoodie person, but this hit the perfect balance of being shirt-like with the benefit of a hood and kangaroo pocket. The fabric is another one of Pistol Lake’s custom fabric blends, Eclon (46% nylon, 42% polyester, 12% spandex). It does not have a technical sheen and has that Pistol Lake softness we’ve come to expect. Is somewhat heavier than the Midweight Eudae used in their One-Bag Henley (our review). For me it’s the perfect weight for a hoodie. It strikes a balance of warmth, where it is suitable throughout all the cooler months inside while still keeping you warm outside in the shoulder season. This also lends to being able to easily wear a jacket over the hoodie when needed. 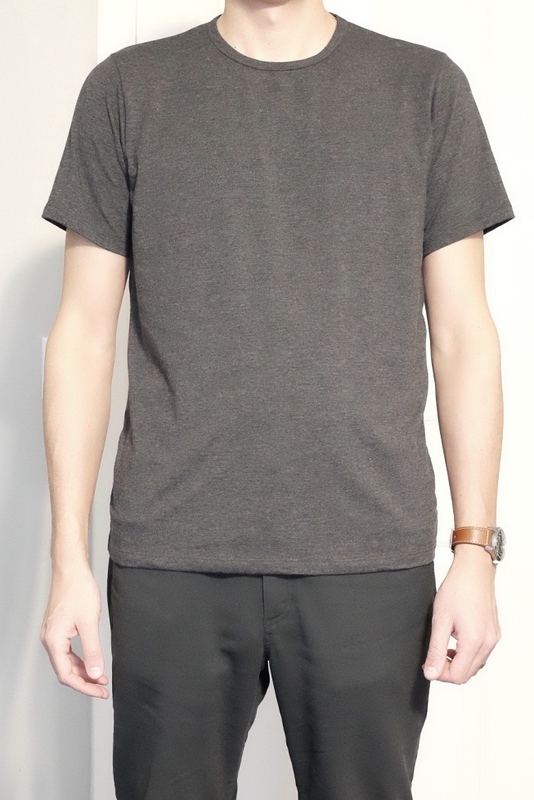 While not as close fitting as the One-Bag Henley or Minimalist Tee (our review), the cut is still athletic and fits close enough that it makes for a comfortable layer without looking bulky. 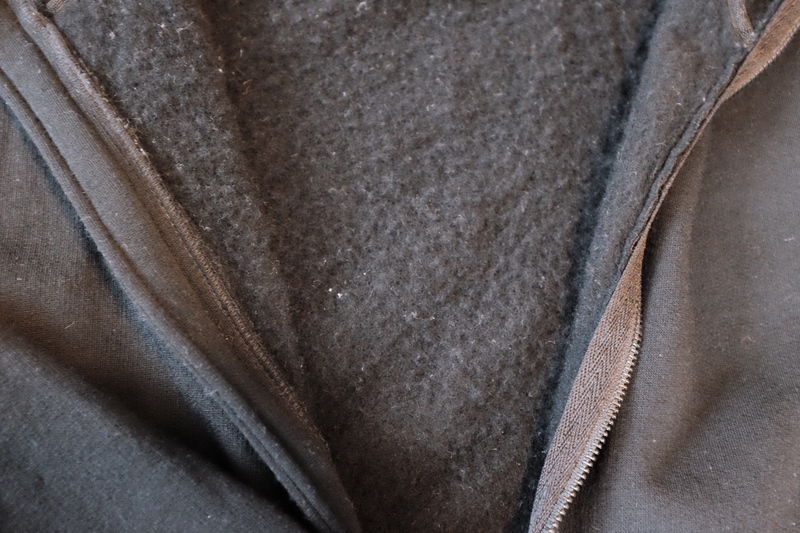 The generously curved hem at the bottom makes it a little longer, which is great for a hoodie. 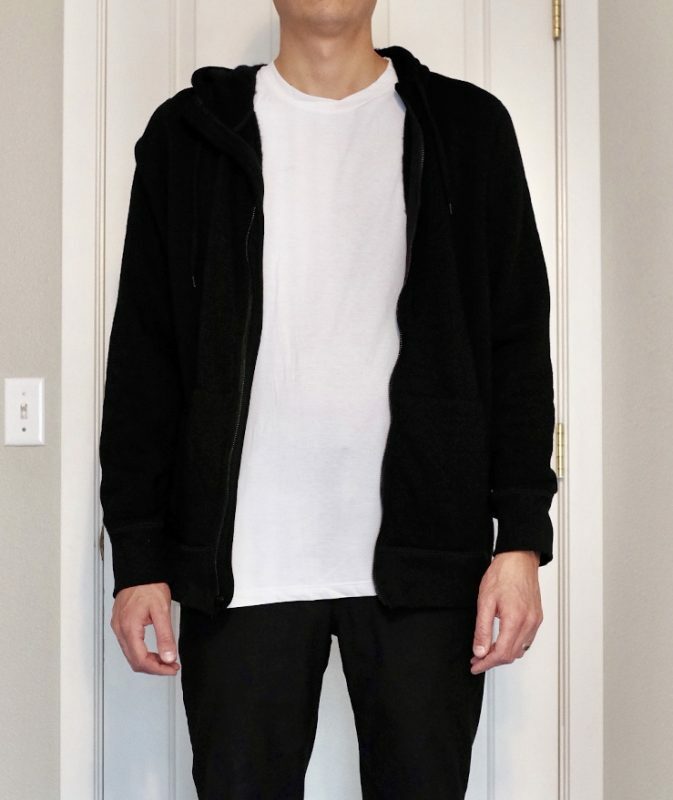 It has become my go-to layer for around the house since the weather has gotten cold, as well as being nice enough to wear around town on the weekend. 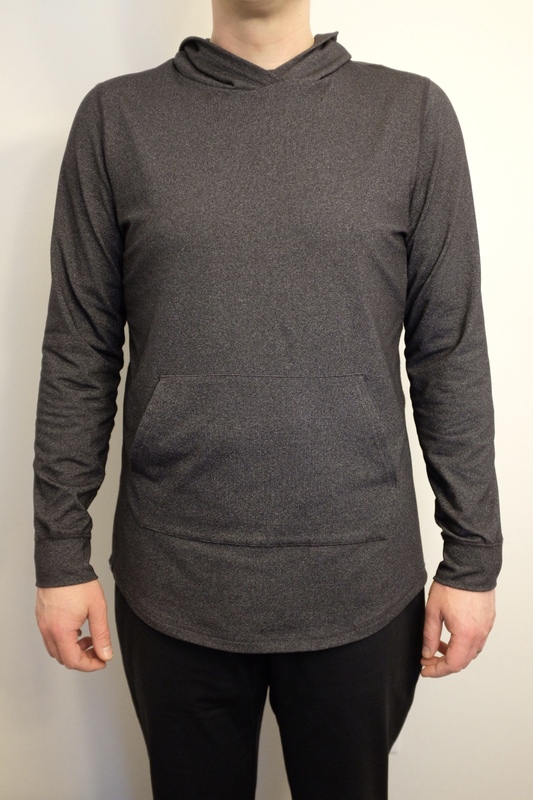 The combination of the softness and stretch of the fabric makes it the most comfortable layer I own. As far as odor resistance, I haven’t really noticed any smell before I’ve had to wash it for other reasons. When washed, the fabric dries surprisingly fast for its weight. 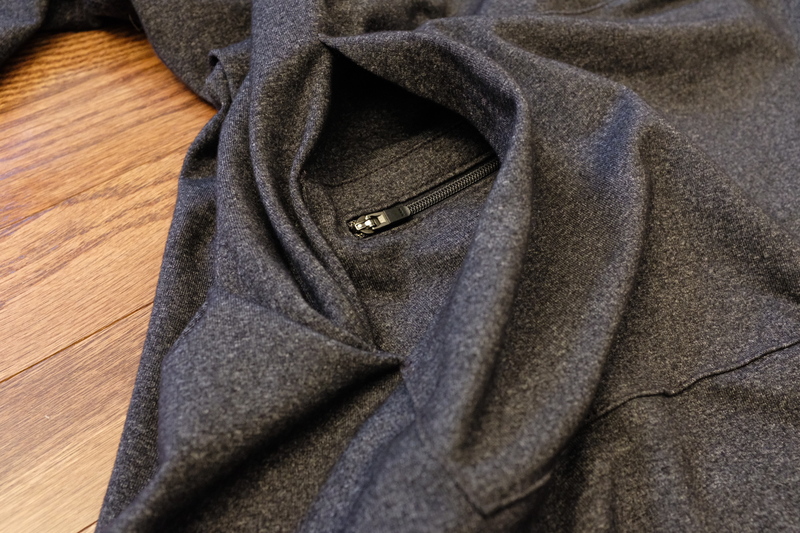 There is one unique feature — a hidden cell phone zip pocket inside the kangaroo pocket. While I always find it awkward to carry anything in a hoodie pocket, my iPhone XS does fit. While I haven’t used the pocket for my phone, I could see using it to hold a key and/or ID when I don’t want to carry a wallet or phone. 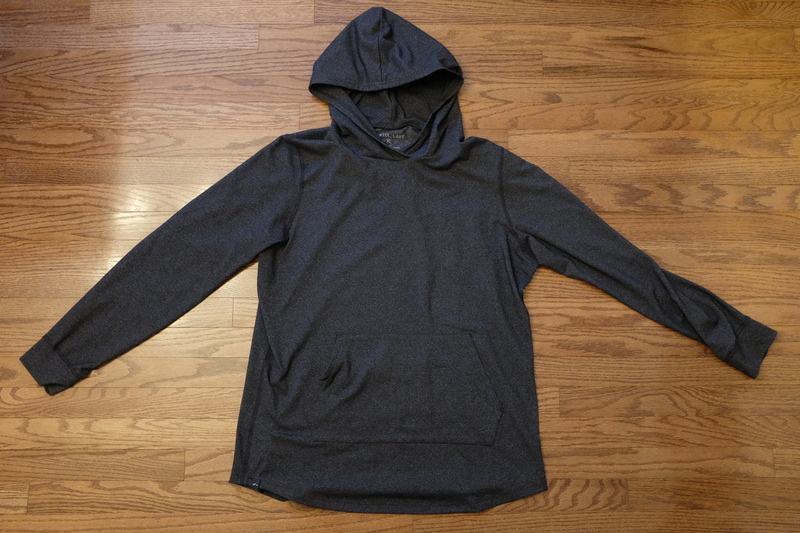 The Pistol Lake Minimalist Performance Hoodie surprised me and has become a staple in my cooler weather wardrobe. The soft and stretchy fabric makes it comfortable in any situation, while the cut and styling makes it nice enough to wear around town. 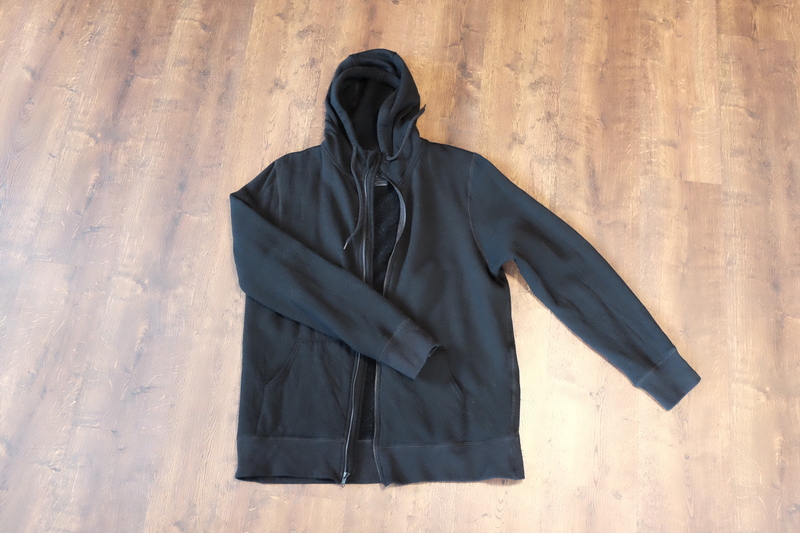 If you are looking for a midweight, comfortable, and good looking hoodie, this one should definitely be on your list. 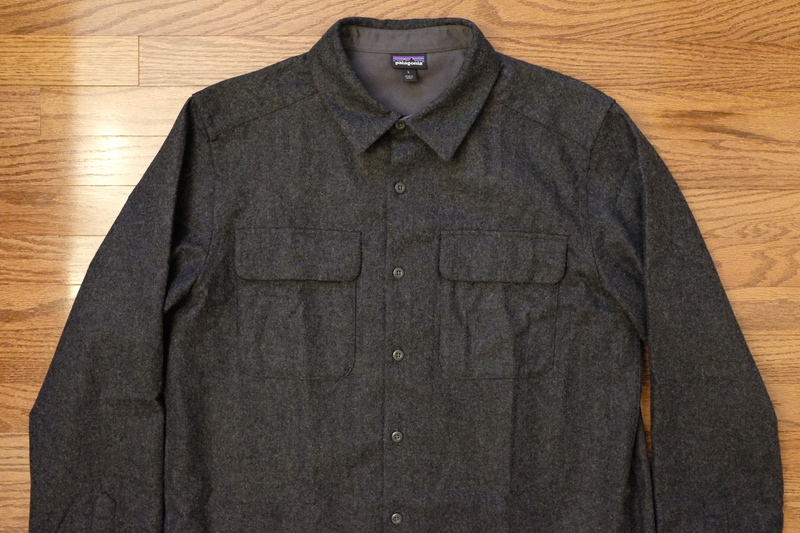 Patagonia has been pushing the boundaries with recycling clothing fibers into new clothes for a long time, and the Long-Sleeved Recycled Wool Shirt takes recycled wool, polyester, and nylon and makes it into a great, all around casual, heavy shirt. You also can’t beat having Patagonia stand behind a shirt like this, as I could see it used in many conditions, from a casual day around town to camping in the woods. 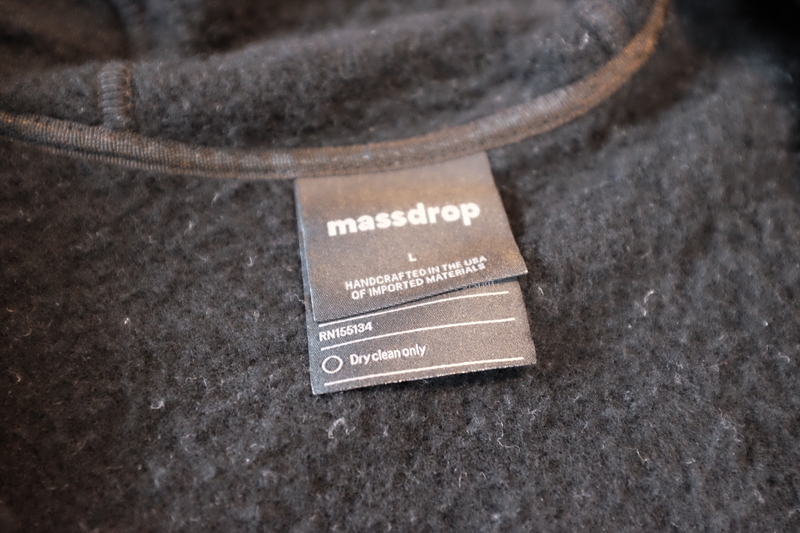 The fabric is a 6.9 oz blend of 60% recycled wool, 30% recycled polyester, and 10% recycled nylon. The Forge Grey color shows good variation in the color and has a nice texture to give it some visual interest. 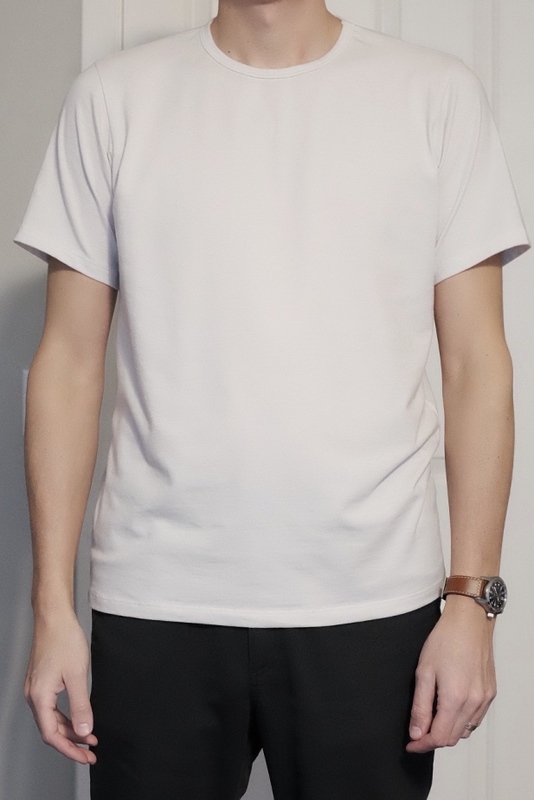 I’ve seen some complaints of the shirt being scratchy, but it doesn’t bother me due to the lining in the cuffs and neck/collar. However, if you generally think wool is scratchy, this is definitely not the shirt for you. For those interested in sustainability, the 100% recycled nature of the fabric is also a plus. The wool actually comes from old sweaters, which is a very old process that is now aided by modern technology. Patagonia has been recycling polyester for a long time, starting with making water bottles into fleece, and now they can take other sources such as old clothing. Most interestingly, Patagonia wasn’t able to find a quality recycled nylon fiber until about five years ago and now they are using textile waste as well as experimenting with used fishing nets. This shirt fits me well. Sizing is right as expected for Patagonia, so I found the large to fit well (and have long enough sleeves). The cut works well as it’s close enough that you can wear it with just an undershirt, or it can be worn as an overshirt. Patagonia calls this their “Regular Fit”, and for me it only works untucked (which is perfect for this shirt). The cut plays right into the weight of the fabric, as I’ve found it comfortable to wear indoors on a chilly day while being warm enough to wear as an overshirt on a colder day. As far as the odor performance, I have worn this shirt many times and have not had to wash it yet. The combination of it not being a close to skin piece and having over 50% wool content seems to make it odor resistant. 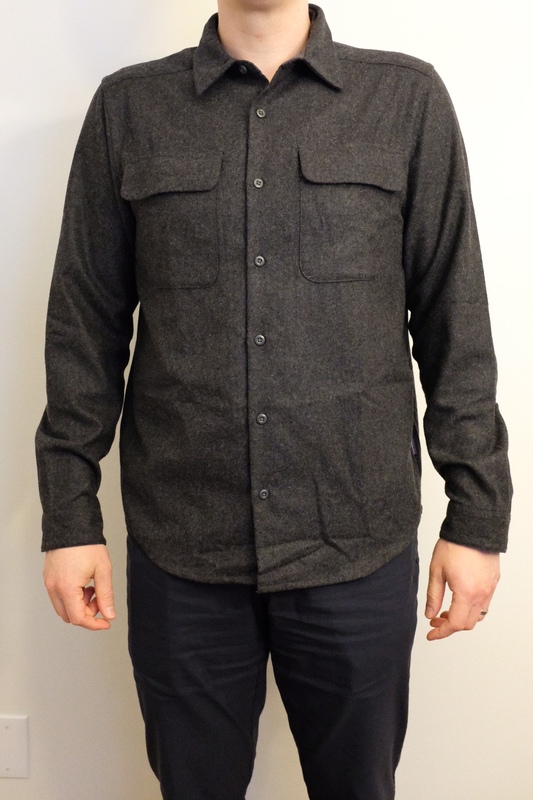 The pockets and weight of the fabric definitely land this shirt squarely in the casual category, however, it does still pair nicely with a nicer pair of pants (like the Outlier Slim Dungarees or Futureworks) and a pair of boots. Since the cooler months have arrived, the Patagonia Recycled Wool Shirt has been my go-to shirt for looking put together and casual. When compared to other similar offerings on the market, the $129 price is an excellent value. The weight and good looks of the fabric, combined with the cut, make it a piece that I’m sure will be in my wardrobe for a long time. The item in this review was provide for Myles Apparel for review purposes. 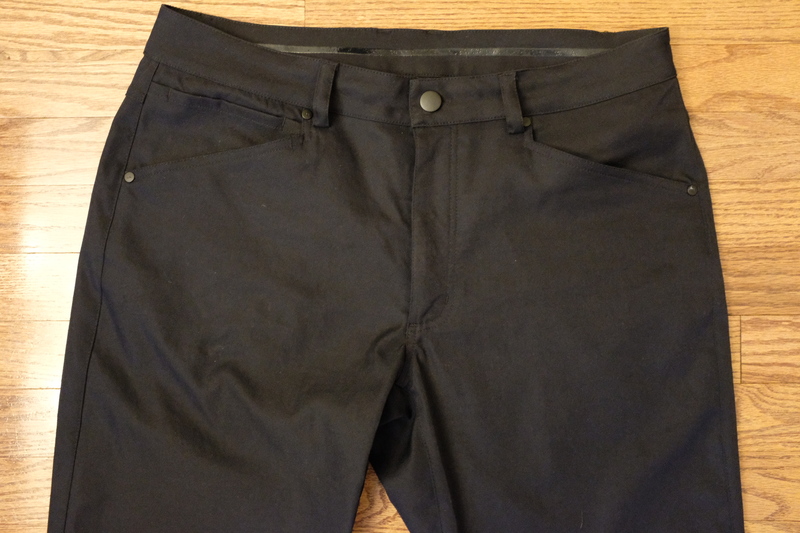 Myles Apparel recently released their Tour Pant to compete in the technical, 5-pocket pant market. It’s marketed as a “classic 5-pocket pant design upgraded with modern features”. I had a chance to give these a good try over the holidays. The fabric is described as a “breathable stretch woven twill” and is 100% polyester with DWR. While there is no elastane, the fabric is quite stretchy, although not as stretchy as my Outlier Slim Dungarees. The weight seems to be similar to the Workcloth in the Slim Dungarees, but this fabric doesn’t have as strong of a texture and has a noticeable technical sheen. I found the weight to be decent for cold weather, and could see the pants transition to the warmer months. One interesting material touch is a tight mesh fabric used for the pockets. 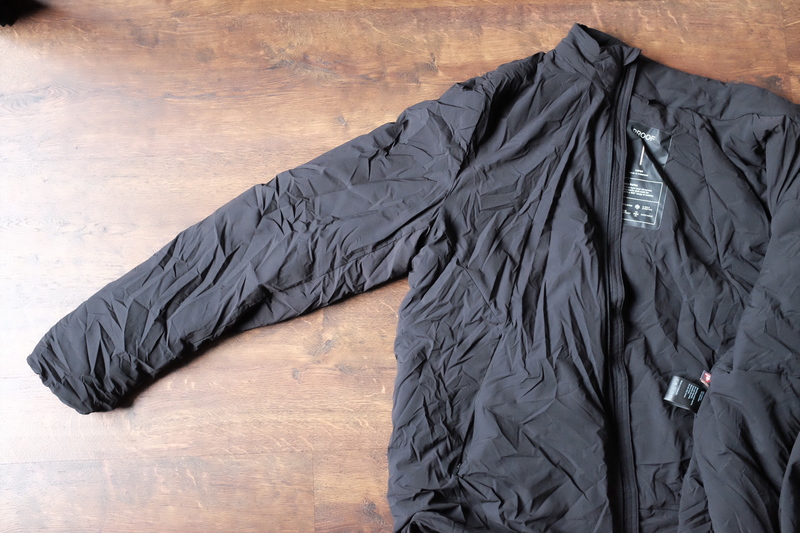 I’m guessing this is to help with the breathability, although I typically feel this is a gimmick that can hurt the durability of the pockets. These pants are a slim/athletic cut with a slight leg taper. The odd thing, however, is the sizing. They are only offered in S-XXL rather than waist sizes. 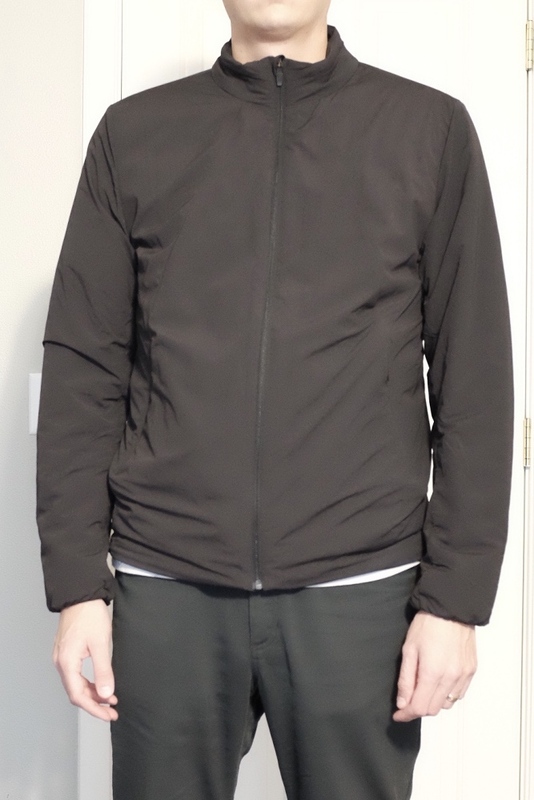 In talking to Myles, I was told that the sizing is consistent with their other pants, so I got an XL (this choice also made sense with their sizing chart). The XL turned out to be unusual baggy in the seat, so I exchanged for a L.
In a L, the waist was slightly tight — made OK because of the stretch, however there is some pulling at the top of the fly flap. Since the pulling is right below the button, it’s hidden by an untucked shirt, but makes these pants unwearable for me with a tucked in shirt. The seat did fit much better though. I also tend to have concerns with tightness around the thighs in athletic/slim pants, but the fit on these, while a little tighter than I usually go, was comfortable. Also, rather than providing an inseam measurement, they list a max height for each size (6’5” on the L). I am 6’2”, and I found the inseam to be perfect, they do offer free hemming by mail though, if needed. The rise of the pants seem to be a bit lower than what I’m used to. I found squatting down to cause the pants to pull down in the back a bit. 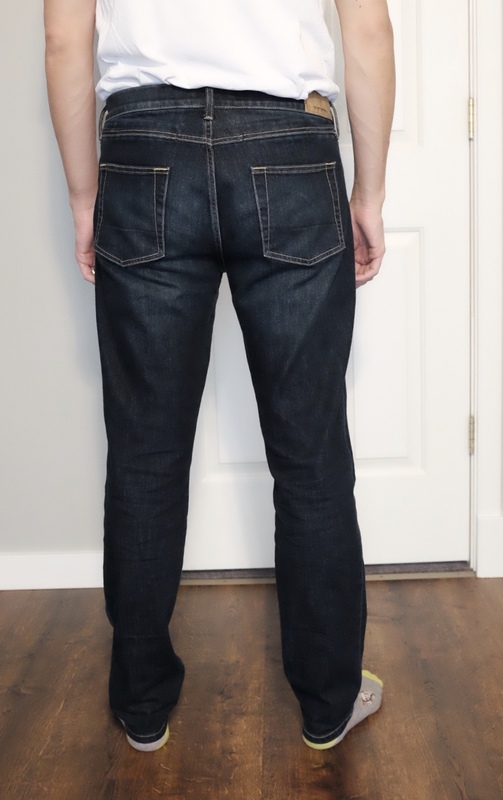 The lower rise also makes the back pockets fall lower than I’m used to — this is something I didn’t notice right away, but became apparent when sitting with a wallet in my back pocket. 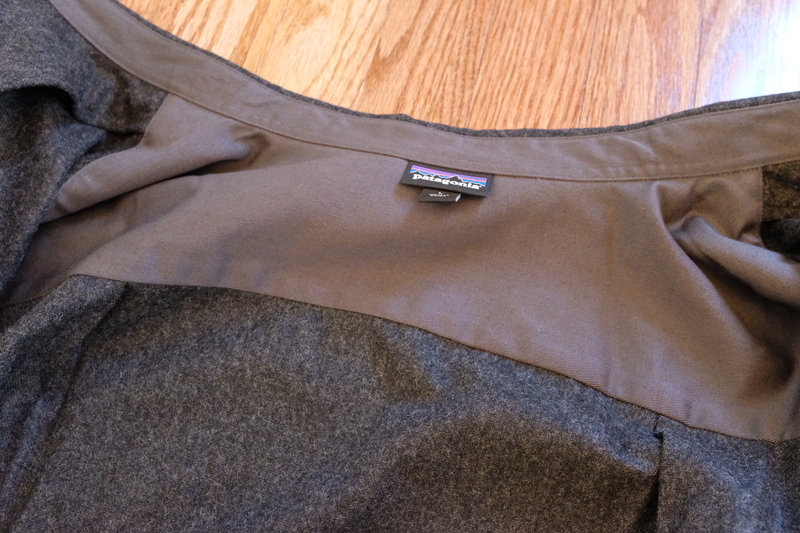 The stretch of the fabric is surprising given the lack of any stretch component to the blend. I never found the pants to constrict my movement and found them to move with my body, although not as easily as a pant with some elastane blended in. 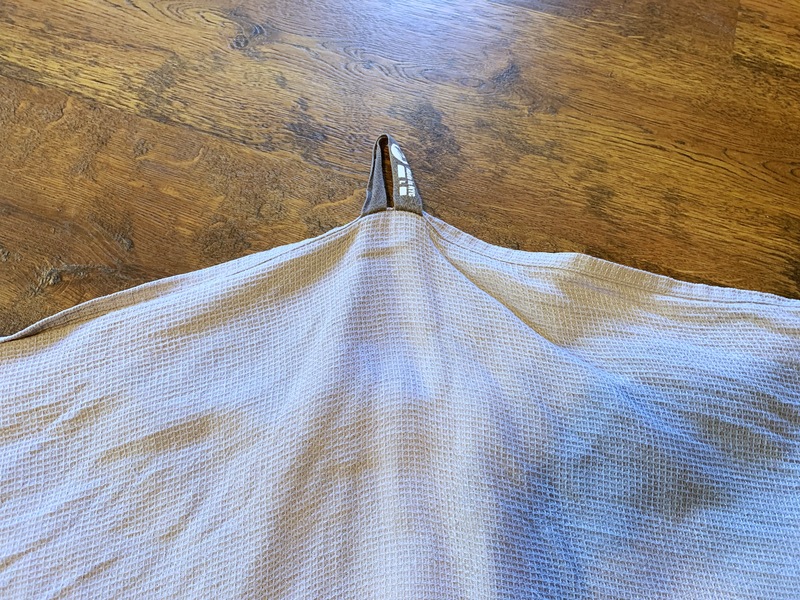 The gusseted crotch also helps with freedom of movement, although I found the back of the pants to pull down a bit when squatting or moving around on the floor when playing with my niece. I’m guessing this is a function of the rise. While not severely tapered, I did find the taper to cause the pants to sometimes get caught on my calves when standing up. The fifth pocket is sized to hold your phone, and it does indeed just hold an iPhone XS. My phone seems secure there, although the pocket is situated high enough that I didn’t find it to be a comfortable place to carry my phone. The other pockets are all nice and deep and things seem to stay put. The right back pocket also has a zipper portion designed to securely hold a wallet or passport, a nice touch and well implemented. 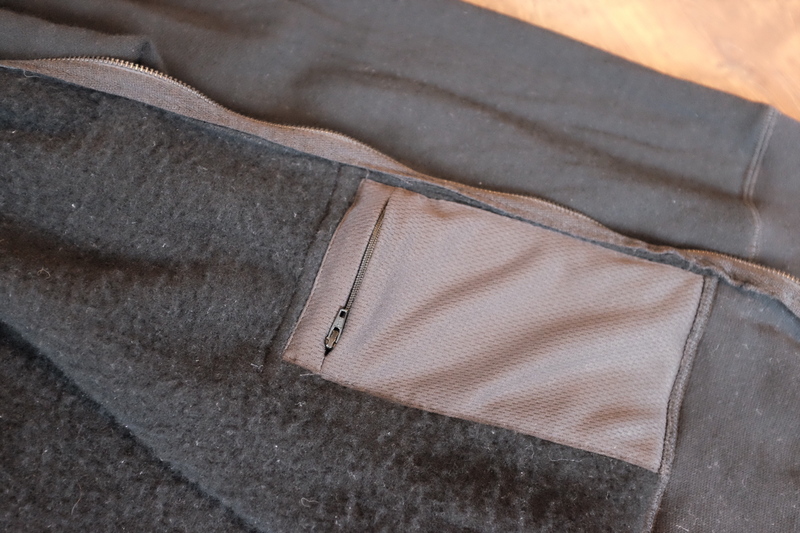 I’ve found some zipper pockets like this to get in the way, but the zipper seems to be well designed here as to stay hidden and out of the way. 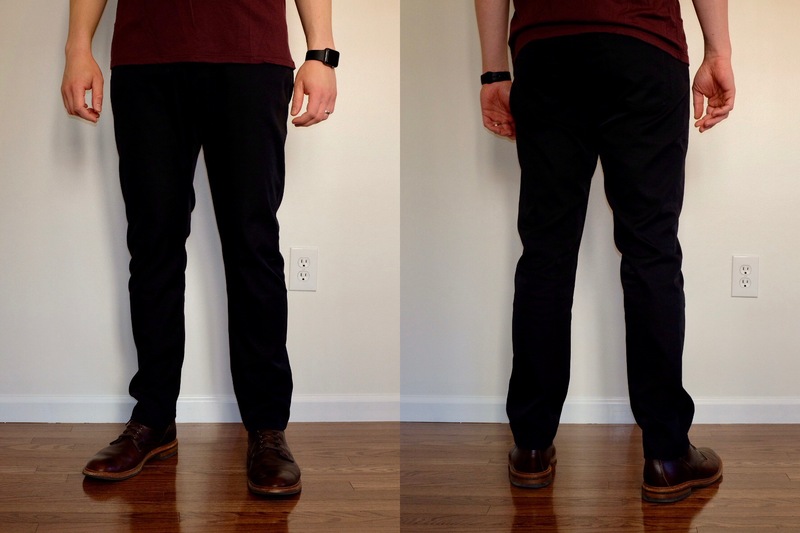 Finally, the technical sheen — this one is a deal breaker for me when wearing the pants. I hoped it would become less noticeable with some wear and washing, but that did not come true. Maybe it’s most noticeable in the Charcoal color I have, but for pants that are targeted for wear from outdoors all the way to work, I expect less sheen. These pants aren’t perfect. While I think a lot of what I don’t like is a factor of the fit, there are definitely some improvements that could be made. Sizing: Only having S-XXL sizing in these pants makes it less likely that you will find a great fit, and seems unusual for a pant billed as looking good enough for work wear. I’d consider making these in the usual waist sizings. Rise: The rise on these pants turned out to be a little too low for me, causing the back to pull down in some situations. I didn’t notice if it was different in the XL pair I had first, but in order to get a fit that was reasonable, I had to size down. Sheen: The sheen of the fabric is too noticeable for a technical pant that is supposed to be able to be worn in many situations. While it may have been OK in the past, there are too many good, non-shiny offerings these days. The Myles Apparel Tour Pant is not the pant for me. While some of my issues are probably due to not being able to find a great fit, the fabric could use some work. If you can find a fit that works for you, the $118 price is compelling when compared to my gold standard of the Slim Dungarees ($198), and it might be worth giving them a try.